Gadar Oriental Medicine’s goal is to provide an effective and uniquely personal approach to healthcare. Acupuncture is most effective when administered frequently, and to that end, Gadar Oriental Medicine employs an affordable fee structure to facilitate regular treatments. Although acupuncture is the most well known part of Chinese Medicine, Gadar Oriental Medicine employs the full spectrum of Chinese Medicine treatment modalities to create custom-tailored treatments targeting not only the patient’s symptoms but seeking to get to the root of the problem. More Access. More Time. More Attention. While growing up in Russia, Filipp could always be seen by his doctor when needed and his doctor personally answered his own phone calls. It was like having a doctor in the family. This may seem old fashioned, but Filipp has modeled his practice according to these standards. At Gadar Oriental Medicine, phone calls are always answered every day of the week, day or night, unless a treatment is in progress. Messages are promptly returned if calls are made during a treatment. Patients are given the time and attention they require for treatments. 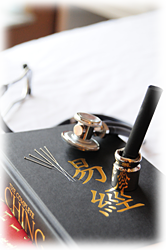 A good Doctor of Oriental Medicine must put his or her own energy (Qi) into each treatment. To that end, at Gadar Oriental Medicine, Filipp Gadar sees no more than ten patients a day, thus ensuring quality treatments. Also, like acupuncturists in China, Filipp inserts needles using the free-hand technique as opposed to using a plastic guide tube that often just gets in the way. The free-hand technique allows for more precise insertion and more effective results.